If the sprinklers turn on manually by twisting the solenoid, then the next step is to check for the proper voltage. If you need a new solenoid for the valve, Hunter makes our products and replacement parts available through our network of authorized distributors. Turn dial to MANUAL-ONE STATION position. Station run time will flash in the display. Use the arrow (>) button to move to the desired station. You may use the plus (+) or minus (-)button to select the amount of time for a station to water. Turn the dial clockwise to the RUN position to run the station. Use a volt meter to confirm there is 25-28 volts VAC at the screw terminals marked "C" and the corresponding station screw terminal ("C" and "2" for example). 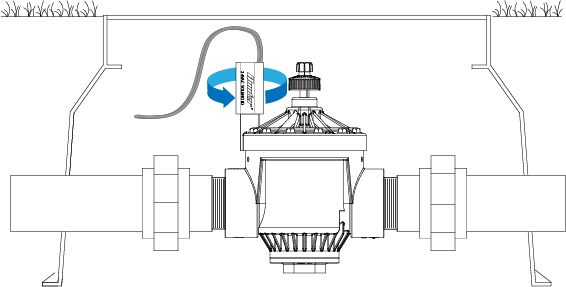 Next, go to the valve in question and check the same two wires connected to the valve for the same voltage. If there is no voltage or low voltage at the valve, you may have a damaged wire or bad connection from the controller. If you have necessary voltage (25-28 VAC) at the valve then the solenoid may need to be replaced.